1999-2005 Porsche 911, Targa, Convertible, GT3. Fitment is nearly identical throughout all models. 99-01’ may require rear fender roll in some applications to prevent rubbing. The first new chassis platform since the 911’s inception. With a vastly different powertrain approach came a vastly different chassis and suspension orientation. While the front suspension and rear multi-link rear suspension was revised and retained from its predecessor, the 996 is very capable out of the box. However, major improvements can be made in the wheel and tire department. 245/40-18 and 295/30-18 tires may also be used. 245/40 and 295/30-18 tires may also be used, but will require at least 1.2 degrees of front negative camber. 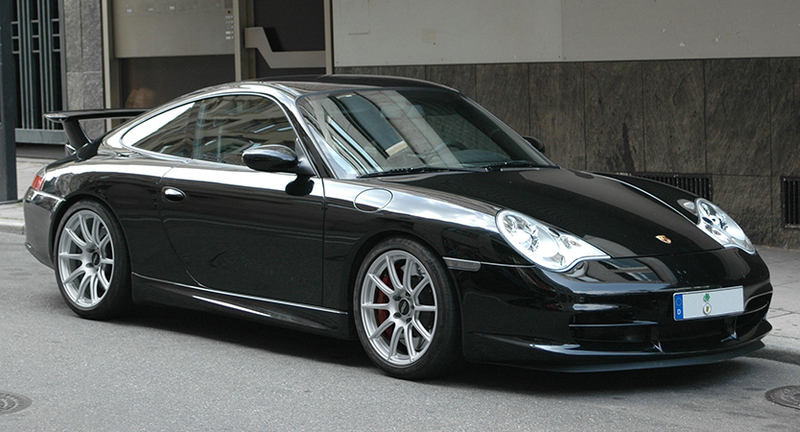 This staggered fitment is very similar to the one above, however the front wheels have a more aggressive offset which ultimately place them 8mm closer front fenders; similarly to the beloved 996 GT2. This fitment is ideal for enthusiasts looking for a flush fitment with street tires, or for performance driving enthusiasts who have the ability to dial in negative camber with wider track compounds. These fitments are effective for both weekend and dedicated track warriors. This no-compromise fitment is ideal for track use where enthusiasts want to maximize front and rear end grip, providing for an incredibly neutral and aggressive setup. The 9” front and 12” rear wheel will provide superior sidewall support for wider tires, and it relies on aggressive negative camber specifications for proper fender clearance. The 9” front and 11” rear wheel setup will minimize the stagger and dial out any remaining understeer. Since you'll be using all available real estate under the fender arches to accommodate this wider configuration, mild modifications are likely necessary. A mixture of negative camber and rolled rear fenders are typically advised to ensure proper utilization of these extreme setups. 255/35-18 and 295/30-18 tires may also be used but will require at least 2.5 degrees of front negative camber. 265/35-18 and 305/30-18 tires may also be used but will require at least 3.0 degrees of front negative camber. Front 255/35-18 tires may also be used but will require at least 2.5 degrees of negative camber. Front 265/35-18 tires may also be used but will require at least 3.0 degrees of front negative camber. Rear requires negative camber pending ride height and tire compound. Rear 315/30-18 tires may also be used, but will require negative camber.